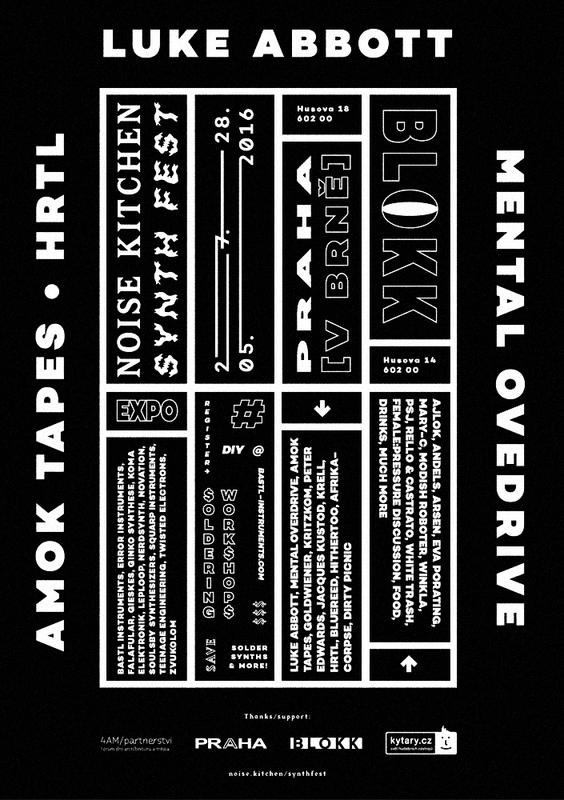 Next week there is the great Noise Kitchen Synth Fest #2 in Brno organized by the Bastl Instruments guys. With many Synthesizers, Modulars, DIY Workshops and performances. And the Nerdsynth will be there, too. 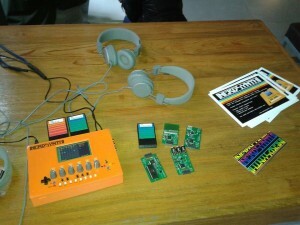 You will be able to play with the recent Nerdsynth prototype and chat with me about its future. Once in a while we show major updates and now we can present the first full video with visual sequencing. Again, this is the very first visual implementation but it gives a clue what it might be. There are also some other GUI updates (player indication, progressbars and the 2 new visual tracks). Thanks for all the support of the last year. We will try our best to get the Nerdsynth ready for betatesting in 2016. 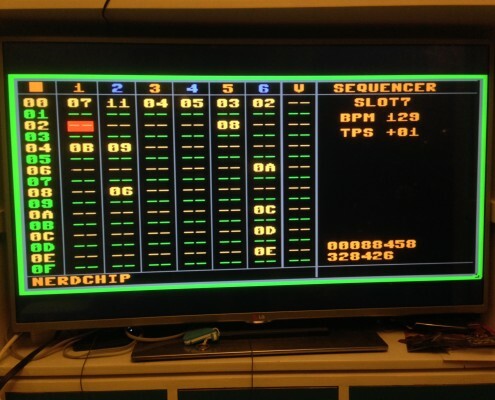 For now, a photo of the Nerdsynth screen on a big TV. 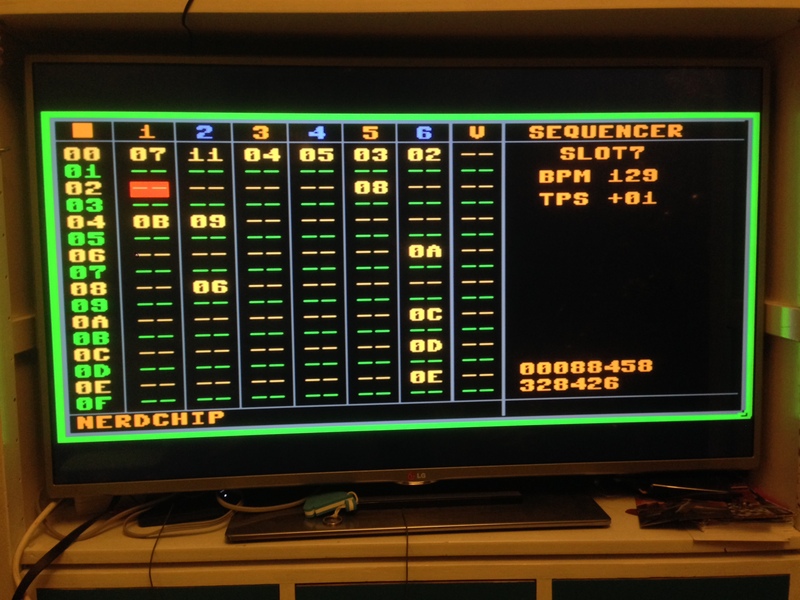 Video output is basically working. 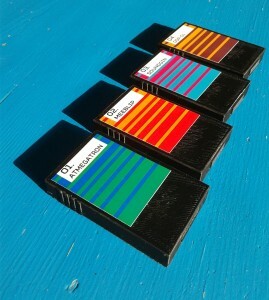 Next to cloning the Nerdsynth screen, there will be video sequencing too to create ‘tracked’ visuals. Autumn has arrived and we have finally finished our new prototype. It’s the first prototype where we can plug in different Sound Cartridges. We made 7 of them: ATMegatron, Meeblip, DSP-G1, Soundgin, SID, CV/Gate, and a DIY one. We designed a proper circuit board for this prototype and had it assembled at a production facility to get a feel for the challenges that lay ahead for the final design of the Nerdsynth. Also, we used a 3D printer to try out different designs for the enclosure of the Nerdsynth. We went to the ADE Soundlab to show the prototype to an audience. The days were pretty busy and we talked to many people, with many backgrounds, but they all agree: The Nerdsynth is awesome! Thanks again to the Stimuleringsfonds Creatieve Industrie for their funding! Next we will prepare a new video which shows all features so far. Stay tuned!